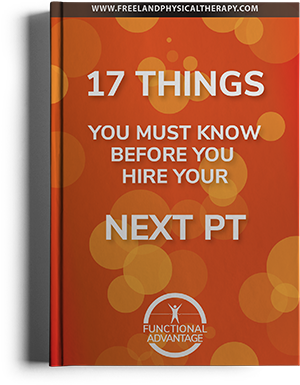 Unsure or not quite ready to start physical therapy? We understand! To help you make a decision and answer any questions you may have, one of our expert Physical Therapist would be happy to speak with you on the phone. We want you to be 100% comfortable with starting your therapy program. Just click the button above to request a phone consultation. You may have numerous questions about the cost and availability of physical therapy before you commit to our program. Please feel free to click the button below, fill-out a short form, and we can answer any of your questions. We realize some people may be “unsure” if physical therapy is the right option for them. If that sounds like you, please click on the link above and tell us more about you so we can answer your questions. Our goal is to help you become more active, mobile and healthy without having to rely on pain medications, injections or surgery. Welcome to the Functional Advantage Physical Therapy resource for injury care. At Functional Advantage Physical Therapy we look forward to helping you achieve optimal health and recover from injuries. Click on the main menu links to explore information related to common work activities. For information on specific injuries, please click on our injuries and conditions category. Our resources on this website are for informational purposes only. Do not diagnose, self treat, or attempt any exercises from the content on this site without contacting Functional Advantage Physical Therapy, your physician or a qualified specialist first. At Functional Advantage Physical Therapy we offer Physical Therapy and look forward to working with you to enjoy maximum mobility and avoid injuries.